The Ancient Waterfront Towns in the South of Yangtze River is part of the Tentative list of China in order to qualify for inclusion in the World Heritage List. Have you seen the movie Mission Impossible 3 and ever wondered...wait, haven't? Okay, watch that first...done? Ok, good. So the last part of MI:3 was filmed in Xitang. You'd be surprised how many people think it is Suzhou because they think "canal + these bridges = Suzhou" as they went there for the gardens. Well, Suzhou has those canals and bridges but it is not the same. 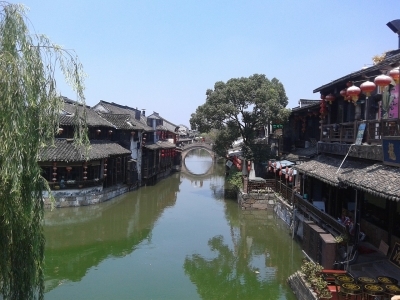 Also I heard people say that Suzhou would be the Venice of the East but actually that was the term also reserved for the water towns (and apparently Hoi An sometimes too). Seeing that the towns are so close to Suzhou I can understand the mistake. As a side note I booked the tour from Hangzhou but I bet public transport to at least one of the water towns is easy in this "Suzhou-Hangzhou-Shanghai delta". I personally picked Wuzhen (as pictured) because for one the tour offering was better and second they told me this is the best preserved one of the four places. I think what they meant was that you get more shops but never mind that now. When you go make sure it is not the deep summer. You will die of the humidity. The tour takes you on a boat ride through the village and then lets you freeroam for another hour or so. It is just enough time to stroll through the area, take pictures, avoid all souvenir shops and get a refreshing drink while doing so. The town is super authentic and every corner has picture opportunities. Whereas I enjoyed the trip I was hoping they would tell you more about the history of the town than just the facts you find on Wikipedia or the WHS description.